I'm happy to have an opportunity to share a parfait with you for #IceCreamWeek. I developed this recipe because while I like the taste of caramel apples, I don't like biting into them. Since my kids were recently in braces I've learned to adapt recipes to suit our needs. 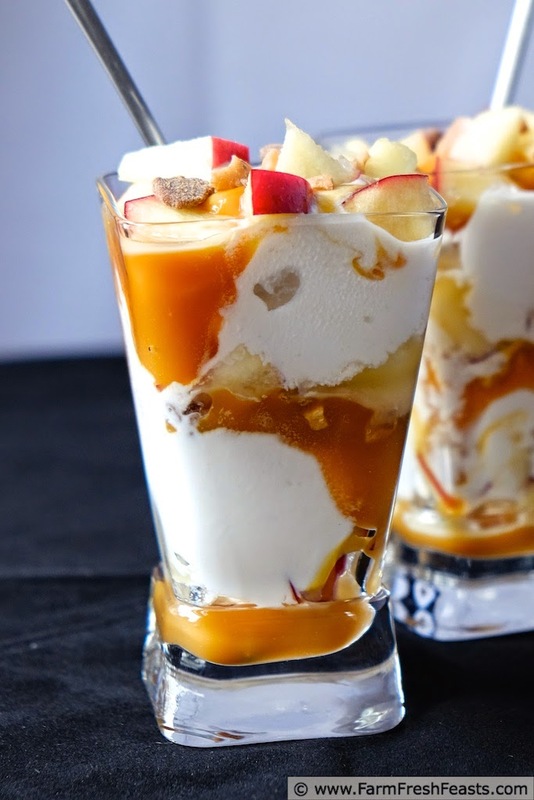 This parfait marries a caramel apple with my favorite apple dip (made with cream cheese and toffee bits). I especially like digging into the chunks of caramel-drenched apples and crunchy toffee bits at the bottom of the glass. When I was a kid, we'd celebrate the last day of school by walking to DQ to get a treat. My favorite was always a Peanut Buster Parfait because I loved those last, ice cream-tinged spoonfuls of fudge and salted Spanish peanuts at the bottom of the glass. Nowadays I cannot finish an entire DQ parfait myself, so I make do at home. Bonus Kitchen Hack: you've probably heard the trick of dipping apple slices in lemon juice or salt water to keep the slices from oxidizing and turning brown. I hope to change your habit to using pineapple juice instead. I keep little cans of pineapple juice in my pantry for this purpose. In my experience, apple slices dipped in pineapple juice will keep chilled for up to 3 days without turning. And they taste terrific! Another note--you can easily substitute vanilla ice cream if you don't want to make the cream cheese ice cream. You will need an immersion blender, an ice cream maker, and a freezer for this recipe. 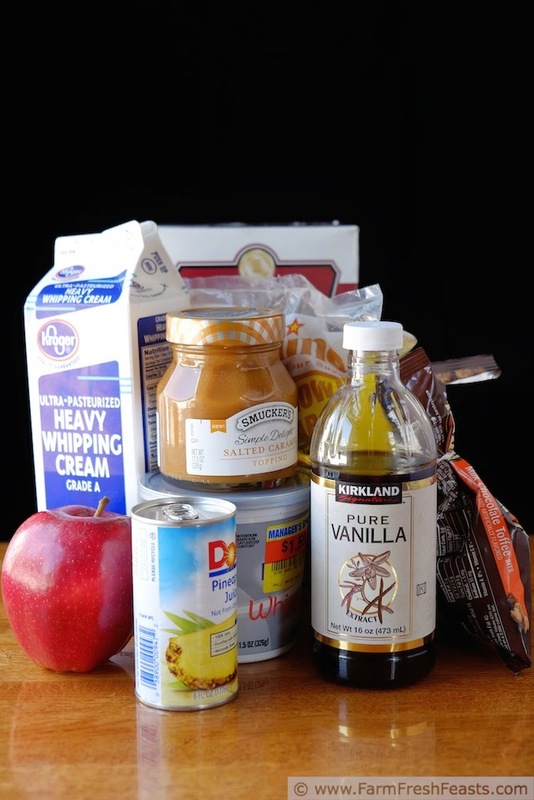 To make the Cream Cheese Ice Cream, combine the cream, half & half, brown sugar, vanilla and salt until smooth. I've used a blender, an immersion blender, and a whisk. I don't like the whisk. Churn in an ice cream maker according to manufacturer's instructions, and freeze for an hour until firm. You'll have about a quart of ice cream. In a large bowl or zip top bag, combine the apple chunks and pineapple juice. They can hang out together for a while or just meet briefly before draining. 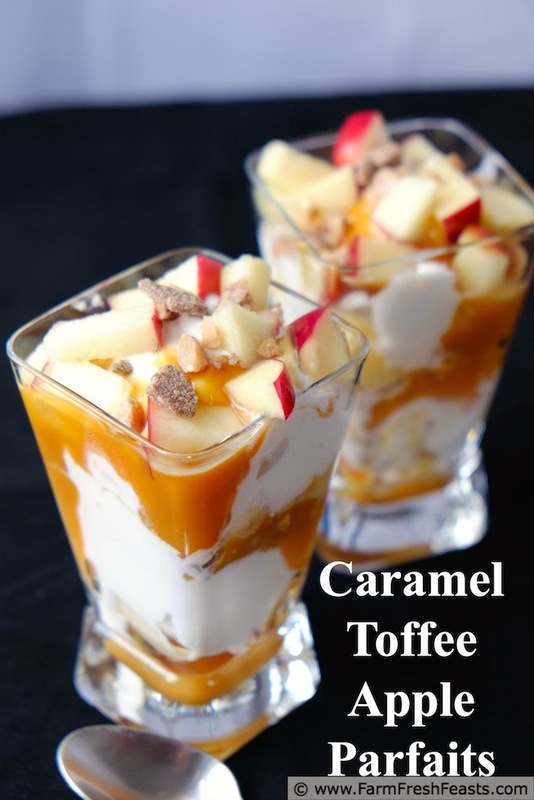 To assemble the parfaits, spoon a tablespoon of caramel topping into the bottom of a tall glass, add 1 to 2 teaspoons of toffee bits and 1 to 2 tablespoons of apple chunks. Top with a scoop of cream cheese ice cream. Repeat the layers as often as you can to fill up the glass (we use little glasses that hold 2 layers), finishing with caramel, toffee, and apples. We would like to thank you all, our readers, for joining in the indulgence this week. Ice cream is always best eaten with friends. Kim and Susan would like to thank all the participants and sponsors for joining in the fun. It takes a village to make this much ice cream! What a great idea to dip apple slices in pineapple-I always think that lemon juice has to much pucker power and takes away from the taste of the apple! It's one of the best kitchen tips I know of, and I'm glad to pass it along! Dude I could not be happier to have you along for the ride this week. I've been waiting for this recipe since you first posted the teaser. It's so freaking amazing. I just want to dive into the dish with it. Thanks so much for joining us this week. It was a pleasure having you. I enjoyed participating with you. You push me to up my game--thanks! You have really outdone yourself with this one. Seriously, I'm panting at the thought of eating this. I should add I'm a pretty panter too. Or Not. Whatever. This bit right here: "Chunks of caramel-drenched apples and crunchy toffee bits at the bottom of the glass." I want it. What a great looking treat this is!! HUGE YUM!!! Thanks! I'm awfully pleased with the result! I've been looking forward to this recipe ever since you gave us a sneak peek on Facebook. Nom! So, teasers work? Good to know. mmm this sounds amazing. Thanks for sharing this recipe. My dog is named Simon. After Simon Pegg, but that's beside the point. It's a lovely name.